In continued attempts to prevent costly display damage due to accidental drops, Apple has devised a system that automatically extends retractable tabs above an iPhone's screen when a drop event is sensed, thereby creating a buffer zone between delicate glass and the ground. Despite concerted industry efforts to develop resilient display cover materials, devices like iPhone are still woefully prone to suffering catastrophic damage when dropped on hard surfaces. Apple addresses the problem in a new patent application titled "Active screen protection for electronic device," published by the U.S. Patent and Trademark Office on Thursday. 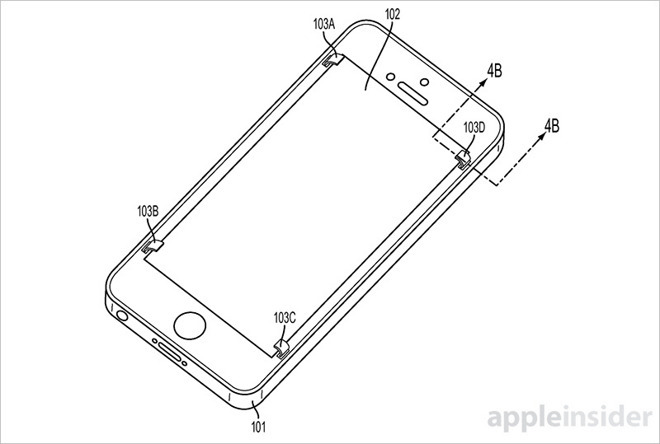 The basic idea is to outfit an iPhone or similar device with a series of retractable tabs that, when activated, deploy outward above the screen, creating a gap and reducing the chance of contact with a hard surface. In some cases, the protectors might curve over the screen, collapse or otherwise absorb impact forces. Apple has in many ways invented a smart shock absorber. In certain embodiments the tabs are installed around a screen's periphery, flush with the display or surrounding chassis. Tab material varies depending on construction, though Apple says both flexible and rigid plastics, polymers, thin metals or other composites are suitable. Powering tab movement are motors or actuators attached to a mechanism similar to a rack and pinion drive. Each motor is operably connected to a pinion that in turn meshes with one or more screen protectors, translating rotational motion into linear motion. Alternatively, an actuator might directly interface with a given tab. The job of drop sensing falls to a variety of components, most of which already come installed in modern iOS devices. Positioning sensors like accelerometers and gyroscopes, or environmental detectors like altitude sensors, are obviously well suited to the task, but Apple also notes cameras can detect proximity to a fast-approaching object (the ground) with specialized motion capture software. In another example audio components can be used to determine height, speed and other metrics by emitting and capturing reflections of ultrasonic pulses. 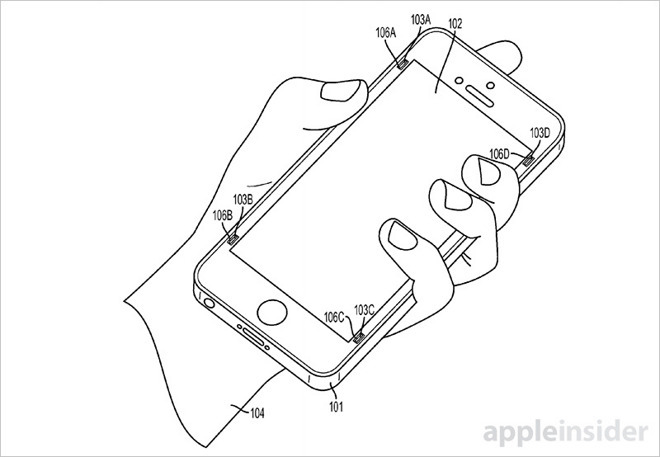 After sensing a drop event, extending a device's screen protectors and absorbing the fall, Apple's system again taps its sensors to confirm motion has ceased. Once a drop event ends, or a preset timer expires, the mechanism returns the screen protectors to a retracted position. 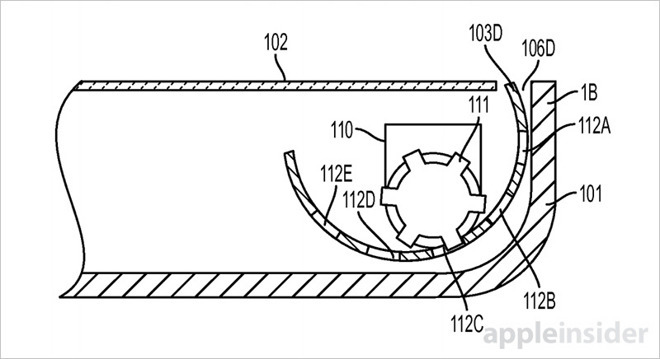 Apple has in the past shown interest in active fall protection for its portable product lineup, but has yet to integrate patented designs into shipping hardware. Instead of elaborate motorized mechanisms and complicated mechanical solutions, the company has chosen to focus on decidedly less exotic —though just as complex, if not more so —work on material-level improvements. For example, the latest iPhone 6s models incorporate specialized Corning glass that flexes to support 3D Touch input, while remaining resistant to surface scratches and breakage. 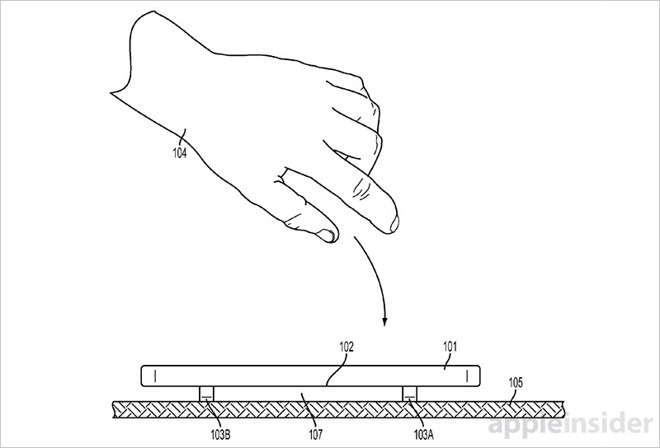 Apple's active screen protector patent application was first filed for in April 2014 and credits Tyson B. Manullang, Stephen B. Lynch and Emery A. Sanford as its inventors.